Sometimes, I can spend the whole afternoon preparing and cooking Saturday’s dinner. And that’s exactly what I did last weekend. It’s unusual for me to take over the kitchen at this time of the year, but I had a week off college (they call it reading/ study week). I had two days left to make the most of my time (besides spending my weekday afternoons to catch up on tv shows) before drowning in homework for two more months. If you live with friends or family, do they ever want to clean out the fridge or freezer? My dad is like this ALL THE TIME and he drives my family crazy. He is probably the one that likes to buy roasts (when onsale at the grocery store) and freeze them for our family gatherings. And HE is ALSO the ONE who complains that there is NO room left in the freezer and that we should eat the items in there (pulls out hair!). So Saturady was a day of cleaning the freezer out with beef brisket. My dad makes this boring tomato brisket with vegetable stew like dish that I hardly ever eat when he cooks it because to me, it’s just plain stew. So I ventured off into the land of recipes aka food network and quickly found a nice and simple recipe. (Dad and I had gone grocery shopping that morning, so we had most of the ingredients to try the new recipe). With Dennis’ help, we made effort to work together to prepare dinner. There was hardly any difficulty in washing and cutting the vegetables. 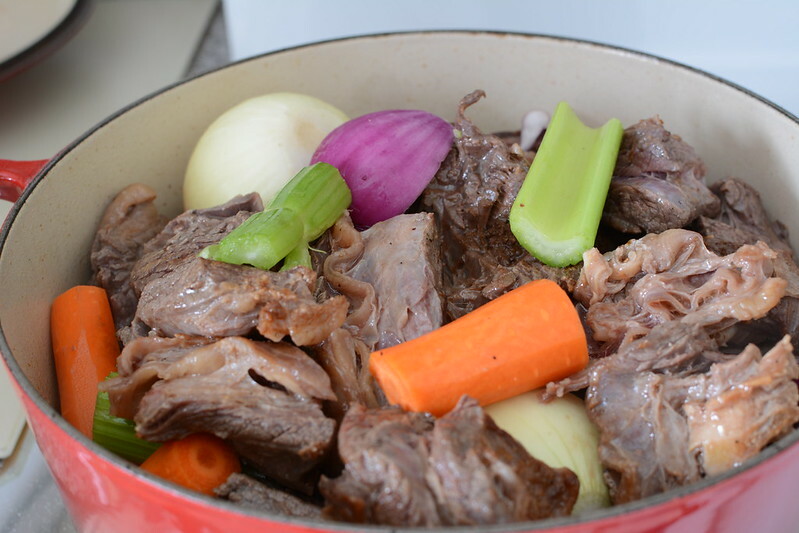 If you don’t have 3-4 hours to spare, I suggest you leave this recipe for another time. The recipe requires occassional stiring every half hour once in the oven. But like I said, I had all the time that afternoon… And Tyler Florence’s recipe surely did not disappoint. Apart from the half hour mixing the beef and vegetables, I’d recommend this to anyone that wants to have a go at trying something new or out of their comfort zone. dinner was served, with a side of toasted bread and steamed broccoli. 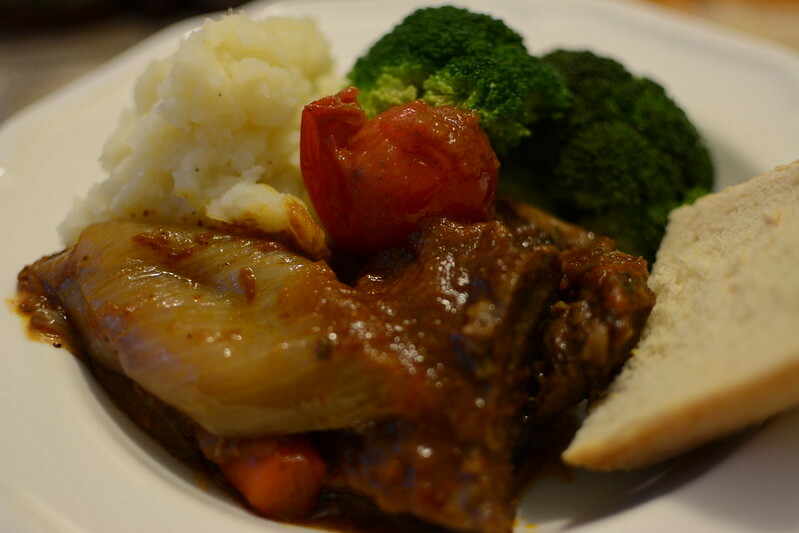 Tyler’s beef brisket recipe & Ellie’s garlic mash.